The best chili recipe in our house is my husband's. No matter what I try, even his recipe, I can't come close. Infuriating. Make a similar portion size adjustment every day for a year and lose almost 8 pounds with no other diet or exercise changes. cheddar cheese and chopped onions. What I couldn't finish, about 25%. Doesn't look like much, does it? Make a similar portion size adjustment everyday for a year and lose 18 pounds with no other diet or exercise changes. 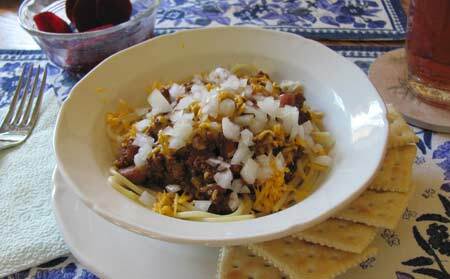 Not a bad way to turn easy ground beef recipes, like chili, into healthy and satisfying meals. Cut the fat, keep the flavor. 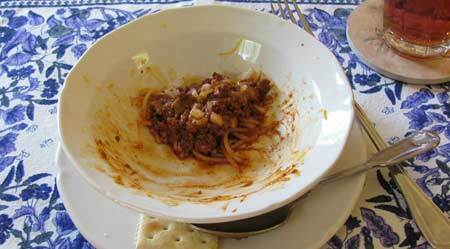 The easiest way to cut calories in chili is to reduce the amount of fat from the meat you use. Find your happy balance between cutting fat and taking all the fun out of eating -- then apply a modest portion reduction. This is what worked for my clients, it can work for you, too.